If you’ve ever decided against touring the Aussie Outback because you don’t have a 4WD, today is your lucky day. Choose destinations that don’t require an especially equipped vehicle – there are more than you think! Know your vehicle’s limitations – consider fuel economy, range, clearance, tyres, weight rating, space – in relation to where you want to go. Outsource the driving (eg take a tour, hitch a ride) when conditions don’t suit. Check all road, weather and travelling conditions in advance – rain, road works, flooding etc can all cause road closures. Take the advice you receive – be prepared to change your plans if conditions are not suitable for your vehicle. Having a Plan B always helps! Get road assistance (eg NRMA, RAA, RACQ etc), but be aware of any exclusions – sometimes road assistance to remote areas isn’t available. Pilchard and I have travelled to all the RedzAustralia TOP 10 Accessible Outback HOT Spots below in either a Subaru** Touring Wagon, a Subaru Forester or a Subaru Outback. Sometimes we’ve even had a NON-off-road camper trailer in tow. We’re not foolhardy risk-takers – we just follow those rules. But if we can have these 10 Accessible Outback Experiences without extreme 4 wheel driving, then so can you! Stand atop the Bunda Cliffs – longest unbroken line of sea cliffs in the world – and watch the whales cavorting below! Yes, you’re in the Outback – and this section of the all-bitumen Eyre Highway separating Ceduna from Norseman, ~1200 km west, is Outback all the way. Crossing the Nullarbor Plain en route from Sydney and Perth, around ~ 4000 km, is one of Australia’s great road trips. Full of life changing experiences – think driving Australia’s longest straight stretch of road; golfing on the world’s longest golf course; and unravelling the mystery of the Nullarbor Nymph (take links below for details) – it’s a TOP Outback experience in itself, even without the whales. 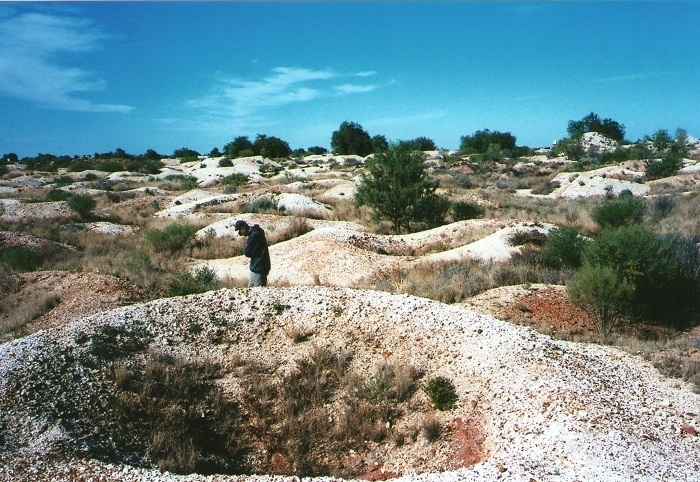 The tiny opal mining town of White Cliffs is the only place in the world where unusual pineapple opals occur naturally. Despite spending a couple of afternoons on the mullock heaps, the only ‘colour’ (opal-speak for actual opal) we found was pretty, but worthless. Maybe you’ll have better luck? We certainly did when we gave the diggings away and ‘found’ some opal in the White Cliffs township, along with the world’s only above-ground mineshaft tour, a self-guided historic walk and unusual architecture shaped by harsh weather conditions and limited building materials. If you’re car’s up to it, take the rugged, unsealed Wanaaring road for 33 km to the Paroo-Darling National Park and Peery Lake, at over 30 km long the largest overflow lake along the river. It’d be difficult to drive yourself north over ~400 km of mostly dirt station tracks through magnificent outback scenery – it passes through 10 pastoral properties. But hitch a ride with the local postie to deliver the mail, catch up with some of the locals and see what’s outside the Quilpie city limits! When you’re done with the Mail Run, climb nearby Baldy Top lookout (top photo) for a great view over this remote Boulder Opal mining town on the edge of nowhere. Explore west by driving 100 km to Eromanga, reportedly the furthest town from the ocean in Australia; fossick for opal at the caravan park’s ‘Deuces Wild’ lease; or drive 75 km south to Toompine for an Outback Pub experience. There’s NO WAY that driving the 660 km of rugged, stony, tyre-shredding Gibb River Road (also known as the ‘Boys Own Adventure’ route) from Kununurra to Derby qualifies as an ‘Accessible Outback’ experience. But the ‘Gibb River Road LITE’ version does! Outsource the driving and hit the notorious road on a 4WD bus (it’s a school bus in its spare time) from North-west Kimberley town Derby for a 360 km round trip on the Gibb River Road to Windjana Gorge and Tunnel Creek, then back again. So sit back, enjoy morning tea and lunch en route to the main attractions, and save your car and/or rig for the bitumen. Road Conditions: Appalling! That’s why you’re letting someone else do the driving, remember??!! The amazingly varied and superb Outback scenery makes the 7 km Ormiston Gorge and Pound walk one of the best short-ish hikes in Australia (IMHO). But it helps that it’s superbly placed amidst the ancient rocky landscape of the West MacDonnell Ranges, traversed by the Finke River, oldest waterway in the world. Ormiston Gorge is the smart alternative if you want to dodge the crowds at Uluru AND experience Outback magic with classic scenery, wildlife and a variety of walks. It’s SO good, a two-night stay turned into six nights! Where: Ormiston Gorge is in the West MacDonnell Ranges, 128 km west of Alice Springs on a fully sealed road. Don’t expect to see horses at the Bedourie races – it’s camels all the way in the lead up to nearby Boulia’s camel race weekend. Join Bedourie locals for a TOP day out with racing, wood-chopping, good Aussie tucker, entertainment and an evening dance – to be held in 2016 on 9 July. Home of the iconic Bedourie Oven, the town sits almost half-way between two other Western Queensland racing icons – Boulia, and the centre of Australia’s racing universe – Birdsville, with it’s world famous race meet held in September. Once the races are over, explore the area or just relax in the town’s Hot Artesian Pools! Or stick around for the Boulia Camel Races – longest track in Australia; then move on to Winton for more races the following weekend. Where: Bedourie is a 216 km drive – mostly sealed with about 14 km of dirt – south of Boulia; or 164 km north of Birdsville – mostly dirt. When: Bedourie Camel Races 2018 Dates TBA, but usually the weekend before the Boulia Camel Races; Boulia Camel Race Weekend on Friday 20th – Sunday 22nd July 2017 AND Winton Camel Races Dates TBA, but usually the weekend after the Boulia Camel Races. Standing on the edge of a massive man-made crater stretching for nearly 4 km and waiting for a blast that’ll knock the sides out even further is like nothing else you’ll see in the Outback. A bold scheme (somewhat like its founder Alan Bond) the Super Pit combines leases and resources to more efficiently mine the Golden Mile – one of the richest seams of gold in the world. A town able to survive because of an ambitious engineering feat piping water from the outskirts of Perth, nearly 600 km to the west, Kalgoorlie is a gold-mining town 24-7. There’s nothing quite like the Outback’s natural attractions – but there’s something strangely compelling about this very unnatural one! A number of localities vie for the honour of being the REDdest place in Australia. But for the reddest accessible outback HOT spot, there’s no contest. Even with my old FILM camera, the red sand dunes west of Queensland Outback town Windorah are so startlingly vivid they almost hurt the eyes. Windorah has the added inducement of being closest town to Australian icon Cooper’s Creek – only place in the world where two rivers meet to form a creek. Then a little further west there’s the weirdly signposted ‘Point of Interest’, and a little further beyond that, The Little Loo at the end of the Universe – my most popular Scenic Public Toilet ever! That’s all very nice. But it’s those RED sand dunes that get me every time! As the crocodiles zig-zagged through the otherwise tranquil waters of Marlgu Billabong, centrepiece of the Parry Lagoons Nature reserve, the 65 species of birds we saw over two visits seemed unperturbed. Maybe the crocs were after bigger prey? That’s why we stayed firmly behind the barriers of the viewing platform over this magnificent inland billabong and breeding ground that attracts thousands of birds. Only a few kilometres from East Kimberley Town Wyndham, the lagoon is a dramatically beautiful dry-season oasis against the stark colours and boab-tree-studded landscape that surrounds it. Where: Marlgu Billabong is ~15 km on a dirt road from Wyndham. Wyndham is ~100 km north-west of Kununurra on a fully sealed road. 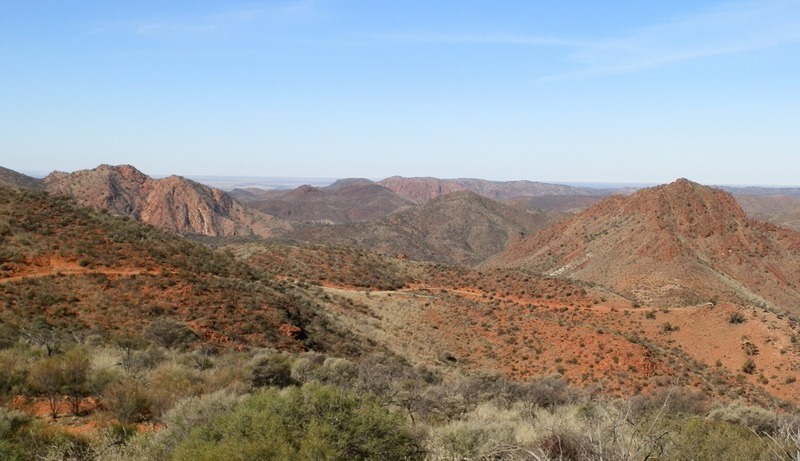 Experience extreme Outback Adventure on a bone-shaking 4 hour return trip through the (almost) trackless adventureland of Arkaroola Wilderness Sanctuary to Sillers Lookout. Even though you won’t be driving yourself on this tour, it’s full of heart-stopping action on steep tracks with vertigo-inducing drop-offs and staggering scenery from several vantage points that show off northern South Australia to supreme advantage. Australia’s premier eco-tourism destination (IMHO), Arkaroola is set amidst a fantastic landscape with an extraordinary array of rocks and minerals, superb natural attractions, amazing self-drive exploratory tours (mostly 4WD only), rugged hikes and an observatory for star-gazing. The Ridge-top tour is conducted by Arkaroola Wilderness Sanctuary and for my money, it’s the ultimate Aussie Outback experience of all time. And I’m happy for any other tour operators to prove me wrong! This post is an introduction to guide you to some of the more accessible Outback Experiences. ANY trip to the Outback, no matter how easy it appears, MUST be carefully planned. Please visit websites like Travel Outback Australia, Outback Australia Travel Guide or Outback Travel Australia for advice and to ensure you are well-prepared, and carry extra water and supplies at all times. ** Please note: These models of Subaru generally have slightly higher clearance than a standard car, and can be switched to 4WD mode if required. tagged with Adventures, All Around Australia, Discovering, Holiday Planner, Red's TOP Ten! Hiking and camel racing! THe outback was one of my favorite places in Australia. It gave me my many first outdoors experience! I love this a lot. I would definitely go back for this. I guess I’ll go on a cooler month though since it looks really open, It might get too hot. The camel racing is generally held in the Australian winter which is Jun-August, Karla. In the Outback it’s still quite warm at that time of the year, but the temperatures are very pleasant. My biggest regret about my (only) trip to Australia is that . . . it was too short. And your post reminds me that I missed too many cool things and that I need to go again. During my trip I visited the red center but I would not mind seeing those red colors again in Windorah Queensland. And please, some hikes . . . Doing a great Australian road trip has been on my mind for years, but I didn’t quite grasp how prepared you need to be, or that we’d need 4WD to visit certain parts until reading this! It sounds well worth the planning and preparations to experience the incredible places you’ve mentioned though. I would love to try pineapple opal hunting, and to see some of the amazing wildlife. Windorah and Cooper’s Creek look awesome too! I have friends in Autralia. I have read about Australia abit. But reading your post makes me understand more about the huge Australia with along rides and diversity in landscapes. In Vietnam we also have a pink sand dune and the winds move hilld back and forth everyday, making the landscapes changed with amazing shapes. Do you have that in Windorah? The pink color here does not impacts the eyes and it is great because it locates by the beautiful beaches wth lovey resorts. Hope to welcome you one day to compare. I grew up in a tiny town called Lake Cargelligo in central NSW, I always thought the dirt couldn’t get any redder than that, turns out I am wrong. Better add a visit to Windorah, the REDdest place in Australia. 🙂 I am in Airlie Beach, looks like its only a cheeky 13 hour drive away. Hah! How cool is the whale watching after the Nullarbor? Seriously spectacular after so much dirt and dried grey grass. Australia is seriously one of the coolest countries in the world. Wow, these are amazing! It’s incredible how many awesome, adventurous things Australia has to offer. Rich wildlife, landscape and everything! Yep, we’ve got it all down here, Carol! Love how much wildlife there is in the Australian outback. I’m amazed at how red the sand dunes are! So RED they nearly hurt your eyes, Jemma! Some of the outback wildlife is a bit unwelcome – like snakes – but it’s all part of the experience! Wow. I never thought of whale watching in the Outback but Bunda Cliffs sounds spectacular, as do all the other places you mention. I actually rode a horse through the Outback when they recreated a historical cattle drive but I honestly have no idea of where we were as we never saw a town. Just flew in and flew out. It was one of the highlights of my travel life but places like Arkaroola sounds just as fascinating. Wow! I remember hearing about the cattle drive horse ride – what a fabulous experience, Carol, but I SO would have had to know where I was!! Hope you get to see some more of the Outback someday! My husband, 73, is bent on taking on the Outback experience! This post makes him want it more. I’d want a 4×4 just because off-roading is fun. But I’m surprised how much there is to do in the Outback! I always forget that Australia has camels, so I was most surprised about the camel races. Haha, there’s thousands of kilometres of bad dirt roads down here if you want a full-on 4WD experience, Jennifer! But if you’re THAT far out, you’ll miss the camel racing! Hi Red, I want to do all of these. I thought I was the quintessential beach bum and couldn’t drag myself from the coast but these ‘red’ experiences are definitely going on my bucket list. Awwww, Red, Windorah is one of my fav dunes, too! We stayed there on each trip just to enjoy the marvelous colors! And, awww, really. It´s sad to read how much we missed , being so near to some great spots – time-travel, please? I took some loo-pics for you in Perth, will let you know when I post them (might take awhile, we took heaps and heaps and heaps of pics). Red, has your postal address changed since 2013? “Honig im Kopf” is available on DVD, German, English subtitles, if you like to I send it over, just wanna check I don´t send it to Nirwana…. I’m with you Red. You don’t have to go serious off-roading to get to some of Australia’s most spectacular places. The trick is to “drive to conditions” and if you think your vehicle is not up to the task then go on a tour! I’ve been to some of the places on your list, but just added a few more Red. Another great post . Roll on retirement! Here I come! Red, far out brussel sprout, you’ve certainly chucked in some interesting facts here! Eg – the longest golf course you say? Also Eromanga and Cooper’s Creek, stuff I had no idea about, thanks! Good tips too. Hitch a ride on the postie van? Haha. I have to say also about Ormiston Gorge, I’ve camped in my fair share of places and it still remains the best night’s camping I’ve ever had. Haha, they don’t call me ‘Red-too-much-information-Nomad’ for nothing, Andy!!!! I get a kick out of finding Aussie world exclusives (like the golf course) and also Aussie exclusives – the unkind would call that being easily amused, but I don’t care!!! We meant to stay at Ormiston Gorge for a couple of nights, and ended up there for 6!! Would have 6 more nights there in a heartbeat … Hope you’re making a list for when u return from OS! PS Thanx for the Nimbin Loo pic – the last time I went there, I didn’t see a loo like THAT!!! These all sound like a lot of fun! But I don’t think i’ll have the time to do most of them, my time is pretty limited. It is going to be realy hard to decide. Australia has such vast distances, Fabiana – kind of like travelling across the US – so don’t expect to see it all in one visit! My tip: pick a few things you REALLY want to do, then look to see what’s near to them and build your trip around that! A great travel teaser post. I like other people driving me. I have enjoyed visiting quite a few of those places without driving myself. Thanks for the suggestions. These are some great ideas for those people who want to experience some of Australia’s outback but don’t have the vehicle or equipment to do so. What a great post! Thank you Kathy! I’m glad you agree – I’ve had so many people tell me how lucky I am to travel the way we do (which is true) but then say they can’t do the same thing because they don’t have the right vehicle. They’re usually surprised to hear what can be done in an almost-standard car and an OLD camper trailer! I still hope we’ll meet on the road one day!! “Red on Red” took my breath away! The colours are stunning! Saw a dingo on the drive across the Nullarbor. And, once many years ago, when I was working on a remote wheatbelt farm. I had just spent the day by myself collecting and stacking mallee roots on a huge paddock and decided to watch the sun dip slowly over a dam on the furthest paddock adjacent to a nature reserve. I sat in silence and took in the utter peace and quiet – except for the lonely call of a crow in the distance – I felt like I was the only person left in the world. Soon, there came a lone dingo to take a drink. I watched in awe as he lapped at the waters edge. 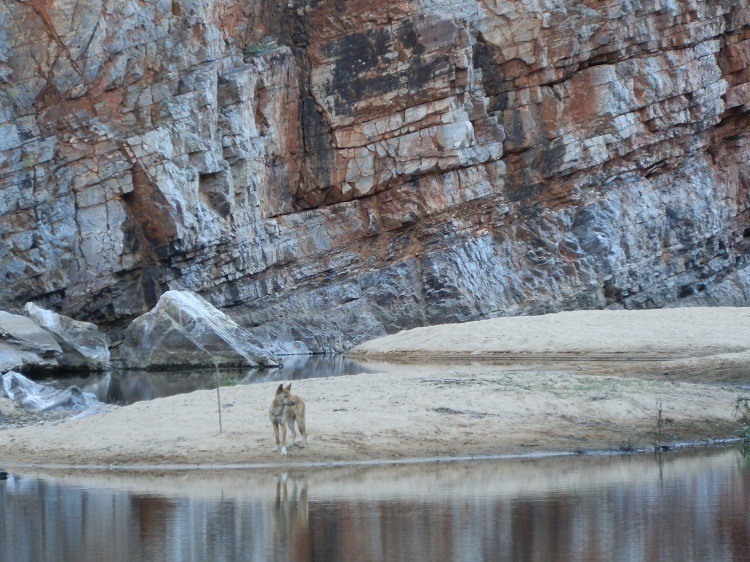 The setting sun turned everything – the dam walls, the ground around it and the dingo’s fur – an even deeper golden red. Just he and me, in silent company. Then, he loped off gracefully back into the border scrub. Not something one sees every day. I’ll never forget it. Magical. I think you’re doing an amazing job bringing your experiences, advice and information here at your blog, Red. And, gives hope to those who would like to tour, in safety, some of the Outback areas that were once thought only suitable for 4WD. Key words – in safety – as long as your very valued advice is heeded. love those whales — you, your country and a camera – what a combination!! Haha, why don’t you tell the Aussie Tourism Commission that, Glen?!?!?! Thanks, mate!! There’s so much that didn’t make it into this post, Chris – you could spend years of your life exploring the Outback properly!! But don’t let that put you off – the wildlife (including the birds) is awesome!! Who knows? You might also discover the next plane wreck! I haven’t been to the real outback you went, but when I visited Aussie nature, I really felt that the places that humans can live were limited and that the earth was very large with lands without anyone. The whale watching is the trip for me. My first trip to Aus in 2012 was just a taster me now thinks! Hey, fun60 – you’ve got to start somewhere!! If I inspire you to come back one day, then my work is done! These pictures all make me want to start booking tours! I couldn’t possibly take him along. You’d be surprised where people take their cats, River!!! We’ve seen cats in harnesses in caravan parks; people visiting an attraction where one of them stays in the car with the cat; and a Park Ranger who told us people in campers or caravans bring their cats along – who then escape because they don’t like being cooped up inside, and ravage the native animals!! So you’re probably right to leave him behind … but that wouldn’t stop you from a short trip, would it?? Have a great day, my friend! Absolutely fabulous, Red! And I love the whale watching. Haha, do you mean Red or RED, Lizzy???!!! Whale watching is all the better for being so unexpected while you’re driving the extremely long way across the Nullarbor! But I’d visit them ALL again any time!! It’s taken us about 10 years (on and off) to get to all these places, Yum – but I’m sure it can be done a LOT more quickly!! Wow, there are some awesome sights and activities in Australia.. I would like to do the Whale watching, wildlife viewing and the Gibb River looks like an interesting spot.. Thanks for sharing, great post.. Have a happy new week ahead! You’d love the bird watching, Eileen! Most of the spots I’ve highlighted in this post have very interesting birds – your list would grow enormously, but you’d be travelling a LOT! Have a wonderful week too! !